When you decide to install a fence on your property, you probably have a specific use in mind for that fence, and that could mean that you already know the exact type and style of fence you’re looking for. If you haven’t looked into the advantages of different fencing materials and styles, though, you should be sure to do the proper research before investing in a fencing system that won’t meet your needs as well as another might. 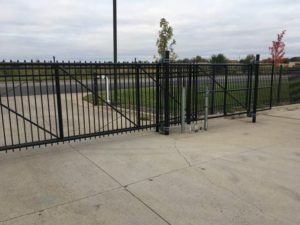 At Twin Cities Fence, we install wood fences, vinyl fences, steel and aluminum ornamental fences, and chain link fences, all perfect commercial fencing systems in their own right. Each fencing system, each design, and each material we use has its own benefits and disadvantages, and different fences are simply better for fulfilling different needs. If you’re having trouble deciding which commercial fencing system is right for your needs, let our fencing installation company help you choose the best option possible. Chain link fences are a highly popular commercial fencing system, and they can be seen almost everywhere you look. You’ll often see a chain link fence surrounding schools and baseball fields, outlining storage lots and parking lots, and keeping trespassers out of restricted and dangerous areas. Chain link fences are a versatile commercial fencing system, as they can be color coated to suit your needs, and they can be installed in various weights and heights. Our chain link fences are made from galvanized steel, hot-dipped in a zinc coating that provides an added layer of protection to keep your fence from rusting and corroding. If you opt for a color-coated chain link fence, you’ll ensure that your fence is as protected as possible with a layer of PVC coating meant to act as a dual layer of weather-resistant material. If you’re looking for a commercial fencing system that will define your property lines, keep trespassers out, and create order on your property, a chain link fence is the most affordable, most widely-used commercial fencing option that will last for years without maintenance. Although vinyl fences come in many shapes and styles, the most common commercial vinyl fencing system is a vinyl privacy fence. Privacy fences can provide a crucial element of safety and security to any business, especially if you need a way to clearly separate restricted areas of your business or property. A vinyl privacy fence could be an alternative to a tall chain link fence, as vinyl privacy fences are more difficult to climb, and they serve as an added design element that can accent a more contemporary property. Vinyl picket fences, ornamental fences, and contemporary vinyl fences can also be used on commercial properties, though these are mainly used for decoration or to separate different areas of your business. You might be looking for a decorative vinyl picket fence or ornamental vinyl fence used to accent your commercial property, or if you’re looking to neatly create lines of separation on your property, build areas for waiting in lines, or create fences to outline driveways and walkways, a durable vinyl fence might be just what you need for a low-maintenance and decorative fencing system. 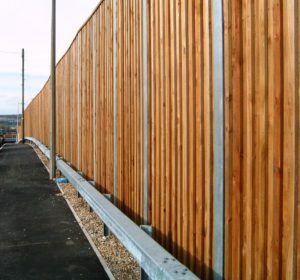 Like vinyl, wood can be used for a variety of fencing needs, as the types and designs of wooden fencing systems are even more diverse than vinyl. With wood, you can create virtually any fence you’d like, including picket fences, privacy fences, and post and rail fences. Whatever you’re hoping to gain from installing your new fence, be sure to consider wood as one of the most intricate materials you could use, able to create intricate patterns, lattice work, and block out sound and sights better than many other fencing materials without looking out of place. You’ll often find wooden privacy fences set up to keep restricted areas clear, picket fences used to add aesthetic value and property line definition, and post and rail fences for outlining fields, creating barriers along pathways, and surrounding waterways to keep areas off limits. You’re probably used to thinking of aluminum and steel ornamental fences as something to be seen outlining yards in spiky points, bringing to mind homes from another century. While it’s true that aluminum and steel ornamental fencing systems typically aren’t found on commercial properties, or even in residential areas, if you’d like a fence that has that wrought iron feel, who are we to say no? The commercial uses of fencing systems have no limit, and most of the time, because we’re so used to seeing fences all around us, we’re barely even aware that they’re there. 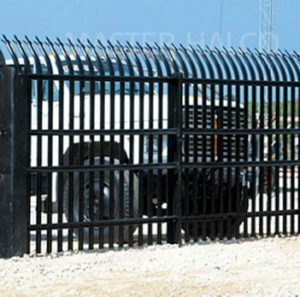 With an aluminum or steel fence, you can be sure that your property will stand out, and you’ll have a durable, weather-resistant fencing system that can be used to create definitive lines and pathways around your property, as is often seen in restricted areas of amusement parks rides, around pools and hotels, and even parking lots to close off parking access. 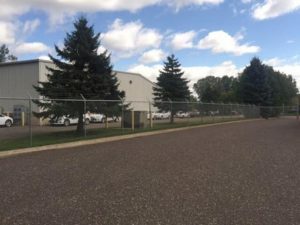 To find the perfect commercial fencing system for your business or commercial property, contact Twin Cities Fence at 612-443-1948 or contact@tcfmn.com, and choose from our countless styles, materials, and designs.